So famous that it continues to be studied and remade almost 200 years after it’s original publication date, Washington Irving’s The Legend of Sleepy Hollow is the perfect classic tale for the Halloween season. Following the adventures of Ichabod Crane’s attempts to woe the beautiful Katrina Van Tassel, this short story brings laughter to its readers with Ichabod’s wildly entertaining shenanigans. But as the story takes a darker turn when Ichabod encounters the villainous Headless Horseman, readers will feel the suspense deep down in their bones. Will Ichabod find love? Will be escape the clutches of the Headless Horseman? Irving’s The Legend of Sleepy Hollow has always been one of those classics that I’ve been meaning to read, yet gets lost in the vastness that is my TBR list…I literally just cleaned it out and it’s already a mess again. While millions of others have a complete and utter joy for this classic short story, I was straining to keep my eyes open…and it’s only a little over 50 pages! There may be a great deal of literary genius behind this piece of literature, but I barely noticed due to the boredom I experienced…NOT what I was expecting in the slightest! I think it’s fair to say that most people know the story of Sleepy Hollow. There’s a legend that a man rides upon a horse yet as no head, chasing after those in the area of Sleepy Hollow. Those of you who have seen the number of film adaptations of this story may be a little disappointed. The action, the terror, the intensity of solving this legend before it’s too late…almost all of it doesn’t exist in the tale. In essence, Irving’s classic is a love story, as Ichabod Crane and Abraham ‘Brom Bones’ Van Brunt compete for the affection of the young and beautiful Katrina Van Tassel. If you’re looking for a story with strong character development, look away. Irving definitely does NOT focus on the growth of the characters in this tale. This isn’t really shocking for a short story, since many pay more attention to the detail of the story progression and language use. The characters themselves, however, aren’t that intriguing either. Irving discusses some background details and characteristics of Ichabod and Brom Bones, yet I still felt little connection to and comprehension of these characters. The details that are given about these characters are displayed in a very “factual” manner, making it extremely difficult to feel any sort of bond. The ONE area I felt that Irving’s short story excelled in is the language. The whole story is a work of art as Irving carefully picks the correct wording and phrase to use when describing the landscape and the characters within his tale. It’s like watching one of those art television shows, watching the painter slowly unveil this beautiful work of art before your eyes. This alone is the main reason why I was able to finish The Legend of Sleepy Hollow, since the whole thing felt like reading one tremendously large poem. Due to the time period in which this was written, there were some phrases or words I had to use a dictionary to define. For the most part though, the story was easily conveyed with little confusion. Though I was fairly excited for this Halloween read, Irving’s The Legend of Sleepy Hollow didn’t do it for me. Though the language is beautifully well-done and the concept of the story sounds fantastic, the execution of the story and the lack of character connection didn’t work in my favour. This doesn’t mean that Irving’s short story is a terrible piece of literature; the studies and literary accomplishments are uncanny and plentiful. That being said, it just wasn’t MY cup of tea; maybe this one will be yours? When it comes to stories and novels written 100+ years ago, it is true that not everyone will connect with the writing style and the language. There’s nothing wrong with that. Thanks! I actually love classic l literature so I was a little disappointed when I couldn’t stand this one haha! 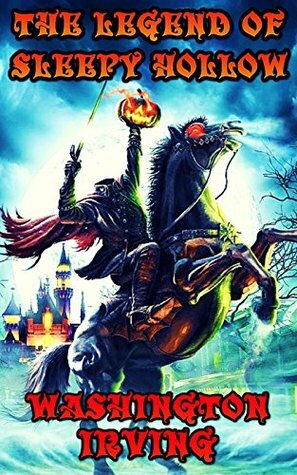 I think a lot of people expect more from The Legend of Sleepy Hollow because of all the remakes that are out there, so it’s a hit or miss with it. I also felt slightly disappointed it wasn’t a little more intense and terrifying. I’m sorry it wasn’t a great experience for you! I’m glad I’m not the only one! I felt so off afterwards since the film and book remakes are so dark and action packed. But it’s ok lol. I’m still glad I read it! I’m sorry you were somewhat disappointed as well! I’ve never heard of this story before. Actually I’ve never seen any adaptations of this story ever either. Your review is amazing though and I toughly enjoyed reading your thoughts on it. I now that this probably won’t be my cup of tea either. I don’t like expecting a dark story and not getting any of that dark goodness I was promised 😂. Oh really eh?? It was pretty popular when I was a kid and in high school. I remember watching a Disney adaptation and I also really love the Tim Burton film! Awe, thank you! You’re too sweet! It’s great to get feedback ha-ha! And yes!! Technically, it is stated that it’s a love story…so it’s the adaptations that fooled me…oh well. I’m glad I finally gave it a shot though, since I know I’d always be curious!